Lowdown on the Hoedown — The Irish Wolfhound Charitable Trust: Charity No. 1169412. The Irish Wolfhound Charitable Trust: Charity No. 1169412. Well, it’s not often I am lost for words (as most folk will testify to), but the Homestead Horse and Hound Hoedown in association with the IWCT literally left me speechless! When the idea of a dog show was brought up at a trustee meeting of the Irish Wolfhound Charitable Trust, I suspect most of the committee envisaged a modest affair with classes for Wolfhounds and some refreshments. However, on Sunday 2nd September The Homestead at South Milford (home to Tracy and Phil Appleyard) drew a great crowd of horse and dog owners and put on, what can only be described, as a breathtaking event with live entertainment, fundraising activities, marquees, a stage, large beer tent and even Irish dancers, all coupled with a Cowboys and Indians theme. The dog show consisted of Irish Wolfhound classes in the morning and then novelty classes after the lunch break. For a year that has had very low attendance at many shows and events, including open and championship shows as well as charity events, the Homestead Hoedown certainly bucked the trend and drew over 40 Irish Wolfhounds to attend and take part in the classes on offer, judged by breed specialist, Sylvia Court, with owners travelling from as far afield as Hayling Island and the Isle of Wight. The Wolfhounds ranged in age from just 14 weeks to a super veteran coming in at 9.5 years old; the beautiful puppies brought along by Louise Pinkney, Alan Lefley and Fiona Dawson (Mouse, Louis and Dillon) came along to support the show and have some puppy socialisation and did very well winning some of the novelty classes (1st in Brace and 1st in Dog the Judge Would Most Like to Take Home). 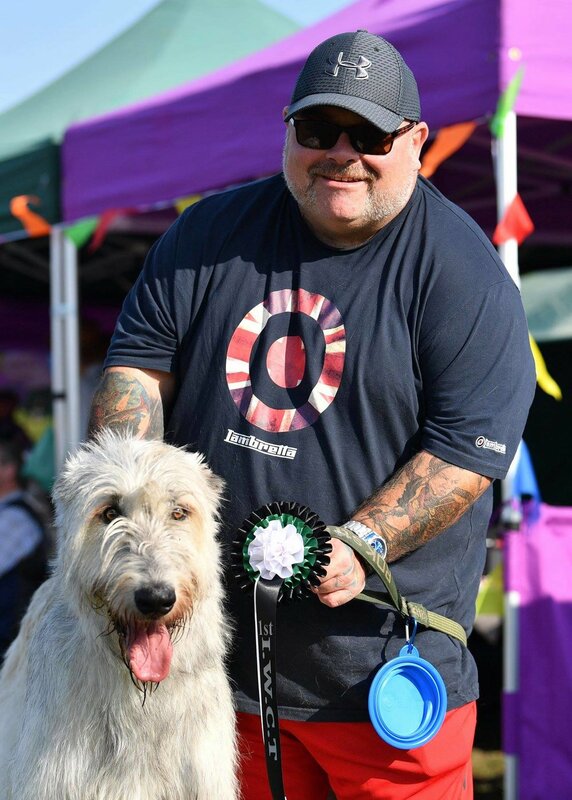 Amanda and Carl Brown’s girl, Daphne, won the Wolfhound Veteran class and the Ellis Challenge Cup and all the veterans completed a lap of honour to rapturous applause. For a full list of the winners, please see below and Best Wolfhound in Show was awarded to Gill and Paddy Grice’s Ahaon, with Reserve Best Wolfhound going to Julie Grimwood’s Baby Arthur. All class winners took home an engraved trophy, as well as some beautiful rosettes and Wolfhound owners, were also treated to a glass of Bucks Fizz as they came out of the ring and received an IWCT goody bag during the lunch break. The novelty dog classes were open to all and proved very popular with everyone and was judged by the rather dashing Dave Taylor. Amongst the novelty class winners were Julie Grimwood and family, who took first prize in the Best Dressed class with their three dogs and fabulous outfits. The winner of the Best Rescue/re-home was also extraordinarily deserving, and for many of us it was the culmination and very happy ending to a sad story that touched everyone’s heart; Arthur (Bonaforte’s Hold On Tight) was returned to his breeder with the help of Roger Tebbutt and the IWRT, and sadly he had suffered some physical injuries, as well as some psychological issues. Arthur found a new home with Ian O’Keefe a few months ago, and it has turned out to be a match made in heaven for both hound and owner and is the wonderful outcome wanted by all concerned. A lot was happening outside the show ring too, and the IWCT raffle and tombola were very well supported, along with the dog class entries. The IWCT kindly donated the tombola prizes that were not won to Hazel Barnes for the fun show at Clifton Park, Rotherham next weekend (8th and 9th September), which this year is supporting Rain Rescue and our esteemed judge, Dave Taylor is also judging classes at that show. We wish Hazel and the team at Rotherham all the best for their event and ask owners to go along and support her cause. The Hoedown horse show also ran a raffle for a beautiful leather bridle and raised a considerable amount to bump up the final figure, and Rosie Walters brought along some of her exquisite Wolfhound crafts and very kindly donated the proceeds to the cause. Rosie also carried out a Wolfhound grooming demonstration, which was videoed and will be added to the IWCT website blog in the near future. Helen Bligh ran a canine quiz during the lunch break, and the photographer is also donating proceeds from the day. We are still waiting to finalise the grand total from the day, but with proceeds from the raffle, tombola, dog show, horse raffle, cake stall, bar, crafts stall, photographs and quiz all contributing to the fundraiser, we are confident of a fantastic result and donations are still coming in. The IWCT cake stall was just one element of the refreshments on offer and owners were given a piece of the IWCT celebration cake in the afternoon. Naturally, visitors needed liquid refreshment as well as food and we can’t deny that the beer tent, expertly run by Paddy Grice and the BCBF team, was a big hit! The party atmosphere had already kicked off with a bang the day before as the volunteers who spent hours setting up the marquees, tables, stage and bar equipment were treated to a pre-show party with those visitors that had also camped over on Saturday night. The party atmosphere continued throughout the show, and during the lunch break, everyone was treated to live music from the fabulous L.A. Jazz Band, followed by the finale of the girls from the McRoibin School of Dance. Despite a very warm afternoon, these young ladies treated us to some sensational authentic Irish dancing and were a great surprise for visitors. As with all such events, it couldn’t have been done without the fantastic support of our volunteers, generous donations from suppliers, our judges giving up their free time, the IWCT trustees and helpers putting in hours of planning and organising, public support both home and abroad making donations and finally, most importantly, from all at the Irish Wolfhound Charitable Trust, a huge thank you to everyone that came along on the day and made this event such a runaway success - we thank you all from the bottom of our hearts, and your generosity will make a difference to Irish Wolfhounds in many ways. Saddle up and chip in to the Homestead High-Falutin Raffle. Further details about the IWCT can be found on the Charity Commission's website.